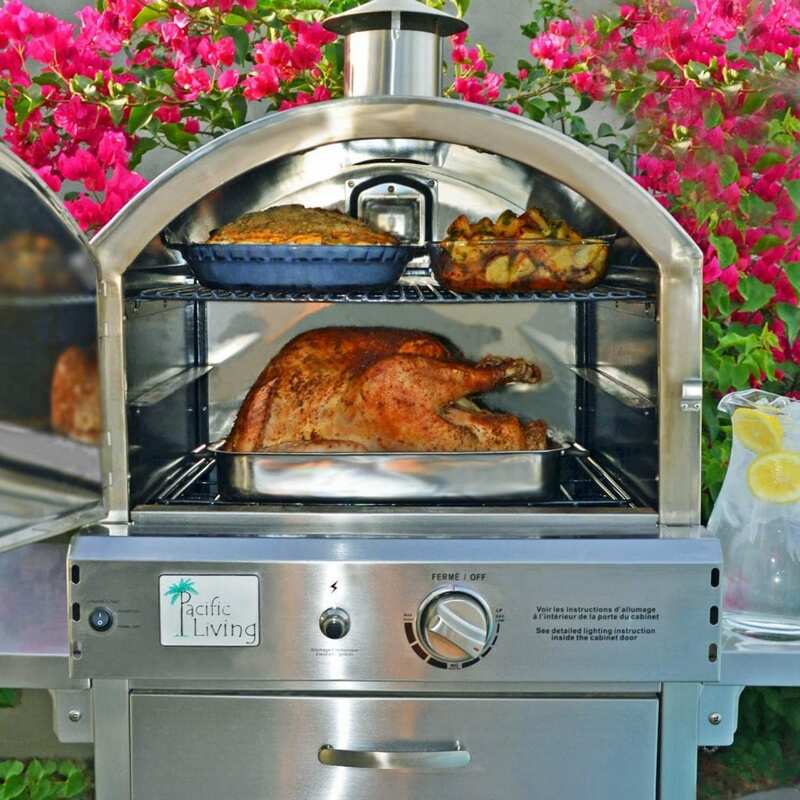 Pacific Living Pizza Oven is probably one of the best countertop outdoor ovens with a huge cooking capacity. 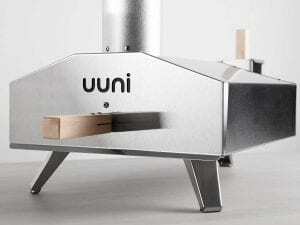 The Oven comes with three racks where you can cook multiple pizzas at a time. The pizza oven is really versatile as well which means you can not only cook pizzas but bread, casserole, meat and even bake a 20-pound turkey without any issues. 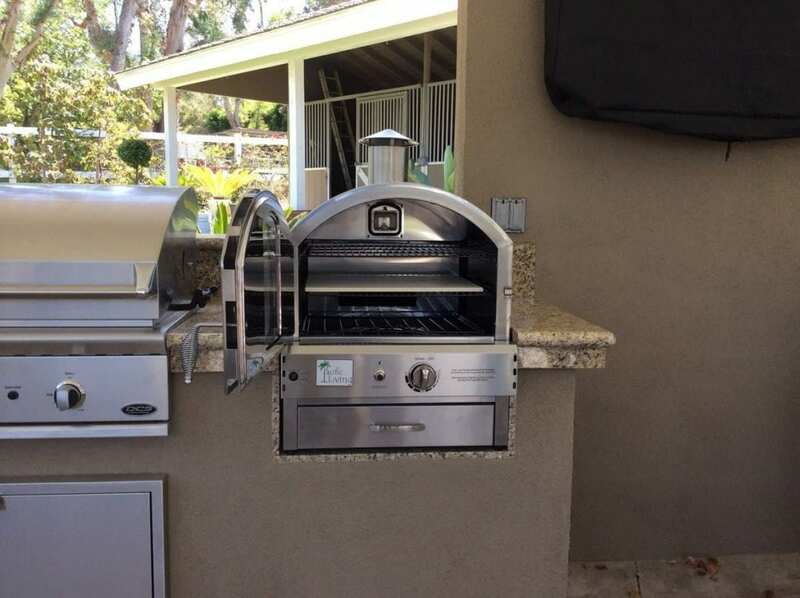 The Pacific Living Pizza Oven is pretty huge and a perfect machine for keeping outdoors and having some family get-togethers and pizza parties in the backyard or your patio. This pizza oven is not going to disappoint you with its skills and with the ability to make pizza in less than 5 minutes, this oven is going to be the rockstar of a pizza party. 1. The Pacific pizza oven comes with three racks which means you can cook a lot of food inside the oven, the maximum size of pizza that you can cook is 15 inches which is pretty huge. As you open the door of the pizza oven, you see a lot of space inside and the fact that you can roast a 20-25 pounds turkey inside should tell you about the power of the oven. 2. The oven is really spacious and very easy to clean. 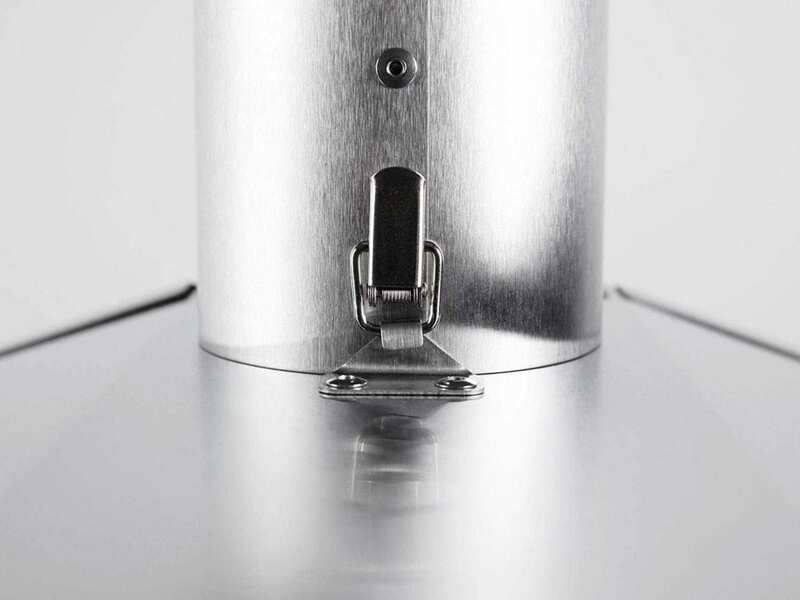 The oven has a stainless steel finish and the structure is double layered so that the temperature is maintained inside the oven for better cooking. You have a thermometer in front of the oven as well in order to know the temperature inside the oven while baking. 3. 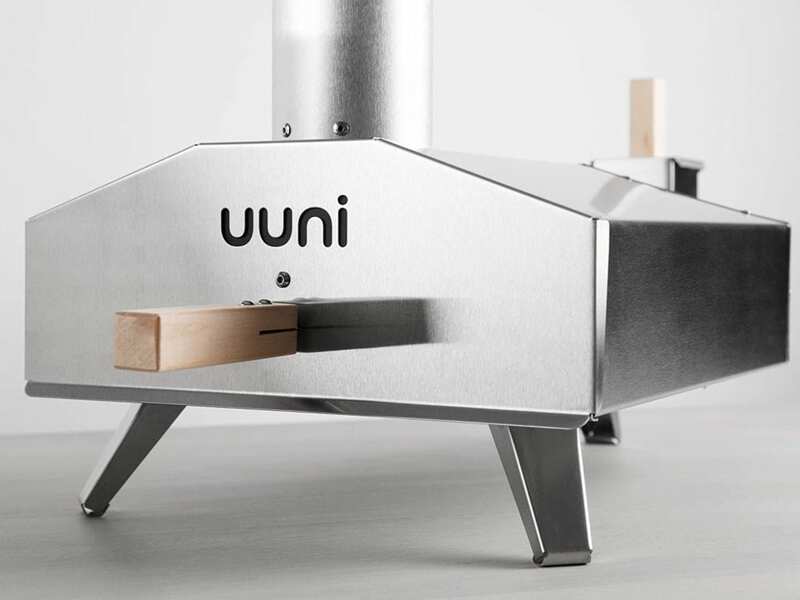 The oven weighs around 38 kgs which is pretty light in comparison to most of the other outdoor pizza ovens, making this oven portable and easy to carry around if you want to take it for camping trips. This is a great pizza oven and can reach temperatures of magnitude 500-degree celsius giving you the perfect Neapolitan style pizza. 4. Not just pizzas but this oven can also help in roasting meat or baking bread and all you have to do is switch the control know the way you like it and you are done. The controls on the pizza oven are really easy to understand and in the case you want to check the cooking inside the pizza oven, there is halogen lights present that help you check your food. 5. The oven can make 15 inches of pizza in less than 5 minutes which is really quick and once you reach the perfect temperature, the second lot of pizzas are going to be faster to cook. It has the perfect pizza stone that will help you get the perfect crisp crust and the gooey pizza toppings. 6. 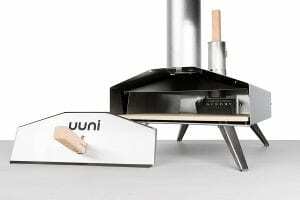 The oven runs on propane so it is a gas fuelled pizza oven. It comes with a natural gas orifice kit for liquid propane to natural gas conversion and the propane gas tank has to be bought separately as it does not come with the pizza oven. 7. 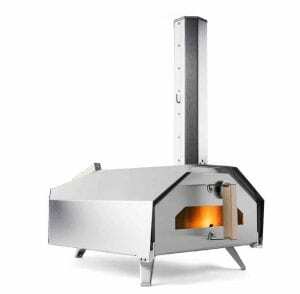 It is safe for a pizza stone to be used and there is a wood chip smoker box for extra flavor included in the oven so in the case you want to feel like the pizza has been cooked in a wood-fueled oven, you can still do it with a gas fuelled oven. 1. There are many users who complained about the glass on the oven breaking and the oven having many dents. However, one of the best ways to avoid this from happening is to check on the oven when you receive it and making sure that there are no defects. 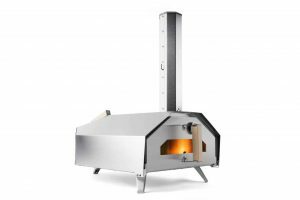 The Pacific Living pizza oven is great and apart from the fact that you need to check it for any dents or manufacturing defects there are no other major drawbacks for this pizza oven. The Pizza oven bakes Neapolitan style pizzas perfectly and in the case, you want to have the perfect restaurant style pizzas in your backyard then this is the oven you should go for. Once you have set up the oven outside in your backyard, you can even have breakfast outside and bake some nice bread or casseroles. This is a perfect oven for pizza parties as well and if you are looking for something that could go from cooking a pizza to baking bread then make sure to check out teh Pacific Living Pizza Oven. 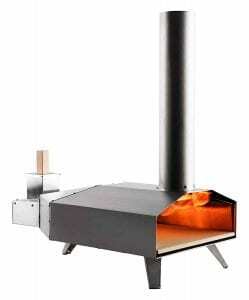 In the case, you have had experiences with this pizza oven then let us know about it in the comments down below as it would help our other readers. 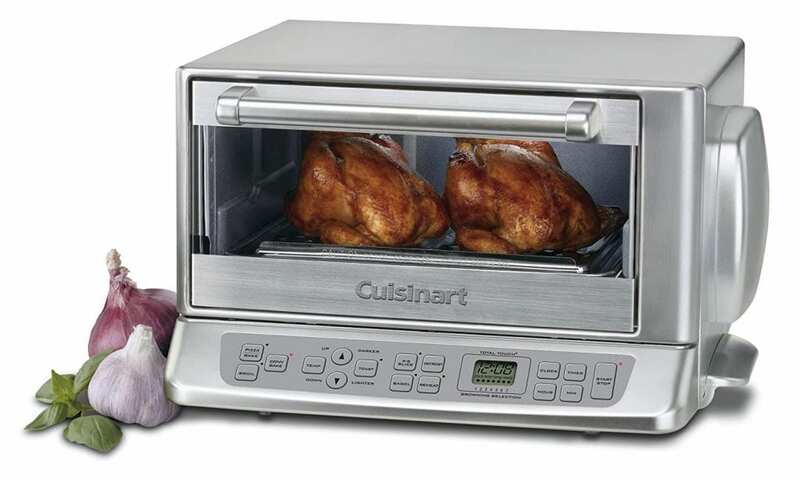 Cuisinart TOB-195 Toaster Oven review is for all those who are looking for a great pizza oven that can cook family size pizzas and bake other interesting recipes. Unlike in the past, today, there is absolutely no reason you shouldn’t bake your delicious pizza in the comfort of your home. Traditionally, this is a job that could be done by a standard oven, but nowadays, there are plenty of Pizza makers alternatives among which is convection toaster oven. Such Pizza makers are designed to replace the typical ovens not only in terms of convenience but also in size and ergonomy. If you are looking for a high-end pizza maker and toaster oven, then Cuisinart TOB-195 is one of the few that might be worth your consideration. Cuisinart has been making home appliances for the last four decades and one of the few American company known to produce high-end kitchen appliances. The appliance is not only a pizza maker, but also a toaster oven with four cooking options of choose from; the Pizza bake function, the toast, broil, and convection. The Cuisinart TOB-195 is spacious with 0.6 cubic foot capacity and can hold 12″ pizza, which is pretty spacious compared to common pizza maker on the market right now. Even better, you can add up a 9″ loaf pan, six slices of toasts, or a four pound of poultry or meat at once. You will also find reheating and defrost controls for various types of food. It also comes with bagel setting which makes it easy to prepare your delicious bagel or your English muffins or thick slices of bread. The touch timer and the setting clock will enable you to customize the experience even further, No doubt; this is probably the most versatile Cuisinart toaster oven you will find on the market right now. Unlike most similar toaster oven out there, TOB-195 accurately maintain heat levels. It uses Exact heat sensor inside the monitor so that heat is consistent and within a very tight range, so, you will get the same cooking results every time. The temperature is kept with +/- 10 degrees of your setting. Also, the interiors are designed in a way that maximizes heat retention; thus accurate temperature is always accurate. Even if you are broiling, the temperature will be precise although you might have to leave the door slightly open during the cooking process. To simply put it, the cooking performance is repeatable with the same setting, which allows you to achieve predictable cooking results at all times. You might notice that this model are a little bit different from other Cuisinart units. It features stainless steel and a chrome look. Most toaster ovens have their controls on the side, but the touchpads on this model are at the bottom. While this might not add any difference in performance, they make it look great and unique on your counter and saves pretty much of your counter space. Its dimension is 18″ (Width) x 17″ (Length ) x 10″ height. One of the most mentioned advantages of this toaster oven is that it heats up pretty quickly, so much faster than most convection oven you will find out there. A regular oven takes around 10 minutes to preheat to 350 degrees, but with this toaster, you will only need 3 minutes to preheat at the same temperature on Pizza /bake function. You can customize cooking time as much as you want since this model has a maximum cooking time of four hours. This is quite impressive considering that most competing brands only have a 2-hour timer. The toaster oven is a high piece of kitchen appliance, but there is nothing that will make you scratch your head when operating it. You won’t find complicating and confusing controls, even if you are technologically challenged. The Cuisinart TOB-195 has an easy-to-use electronic touchpad with a large and easy-to-read LCD screen. All you have to do is select your function, set up the time or shade of toast you prefer and push the start button. The digit buttons are clearly labeled and the screen shows the cooking time and temperature.To get the best out of this toaster oven, you will find an instruction and recipe guide you can use. In the guide, you will learn how to utilize each setting. For instance, if you will be baking fresh Pizza you will be adviced to use the baking tray provided with, and to ensure you sprinkle the pan with lightly splay to make removing the dough easier. But if you will be baking frozen one, you can directly place it on the rack in position B. Even the best product on the market comes with occasional defects, so warranty is important. This model comes with a three years warranty, which is pretty much the best you will find on the market right now. It is is very unlikely to see major complaints about TOB-195 when it comes to durability, it has enjoyed quite a number of positive compliment for lasting five years without significant defects. Although Cuisinart TOB-195 setting is easy to use, those who are fond of the manual dial control toaster ovens may find the setting on this unit a little complicated. You might need to read the manual for a detailed understanding of each function and to get most of it. Trays on this model are only accessible from the back, which means you will have to move the unit forward or turn it to slide the tray from the rear. While this is not a problem to a majority of users, it can be an inconvenience to those with limited counter space. Also, the oven racks may not eject automatically, so you might be a little careful when placing food on and off it. Some of the models out there have interior lights, but this one does not have, and because of its large interior, it can be difficult to see through. Although its performance and additional features justify the price, to those under a tight budget, the toaster oven may be beyond their reach. 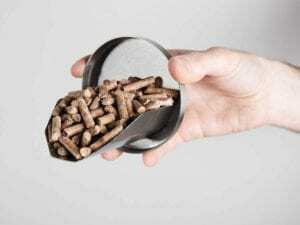 Two its function has default time and temperate which you cannot alter. So you may not have to change them to suit different recipes. Some people also complain about noise, but this is expected to all toasters with conventional fans. The last common complaint noticed is that it tends to get hot along the chrome strip behind the handle. Although the door handle is safe, the area behind it often gets hot. Most toaster ovens have similar flaws, so it is crucial to be aware and heed caution when handling the door. So is Cuisinart TOB-195 worth buying? Despite the few flaws noted above, Cuisinart TOB-195 stand out among its competing brands. It’s probably the best pizza maker you will find on the market right now, so if you have been looking for a high-end pizza maker and a toaster oven, then model might be your best bet. So, keep in mind some of the cons mentioned, but these are minor flaws when compared to similar toaster makers out there. 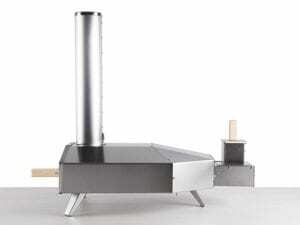 If you can accept the setting inadequacies, this is probably your best pizza maker. If you want to share your experiences with this oven then leave them in the comments down below! If you found this post helpful then do share it with your friends on social media.